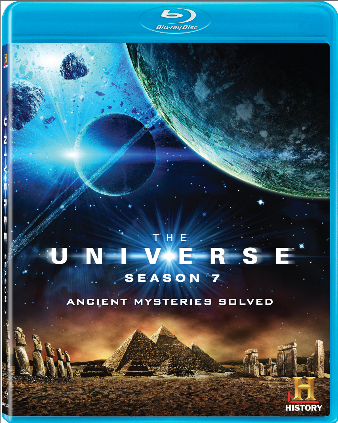 The best-selling HISTORY® series The Universe®: Season 7 – Ancient Mysteries Solved arrives on Blu-ray Disc and DVD May 27 from Lionsgate Home Entertainment. Continue to explore the most fascinating mysteries and hidden secrets in the Universe’s lifetime with this bestselling series. The collection will be available on Blu-ray Disc and DVD for the suggested retail price of $19.99 and $19.98, respectively. How were ancient builders, including those at Stonehenge, able to create structures around the world with one consistent unit of measurement – the “megalithic yard”- despite being oceans apart? This premium HISTORY® miniseries event uses experts and CGI from THE UNIVERSE to reveal the answer and demonstrate how our past is connected to the history of the universe. Title Copyright: The Universe, Cover Art and Design © 2014 A&E Television Networks, LLC. All Rights Reserved. HISTORY, the “H” logo, the “H2” logo and A+E Networks are trademarks of A&E Television Networks, LLC. Distributed by LIONSGATE® under license from A+E Networks Consumer Products™.